Fifty years ago today, January 30, 1969, The Beatles played their last public performance. It happened on the roof of 3 Savile Row in London, headquarters for the band’s Apple Corps. 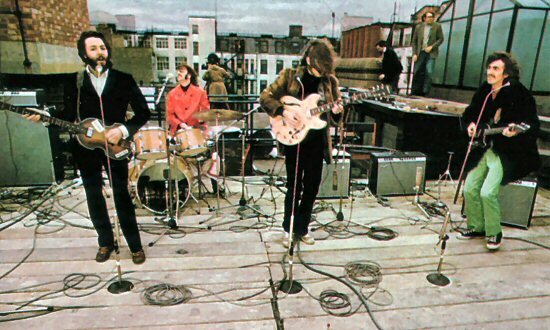 The midday mini-concert (five songs with some re-takes, 42 minutes) took place during the recording of what would become the Let It Be album and movie. The audience, aside from the film and recording technicians, included just a few Apple employees, Yoko Ono and Ringo Starr’s wife Maureen. People gathered on the street and peered out of office windows to catch the commotion. The Beatles had stopped performing live in 1966. Fatigue, the poor sound quality of the shows and a desire to focus on their studio work all kept them off the road. They didn’t need to, in any case. By some accounts, The Beatles have sold 600 million records. Sgt. Pepper alone has sold 32 million copies. Times have changed. Today, live shows play an outsize role as sales of music have plunged. A few weeks ago, the rapper known as A Boogie Wit Da Hoodie set a dubious record: lowest sale total ever for a #1 album. Hoodie SZN “sold” 58,000 copies, but that was almost entirely due to 83 million streams. That consumption is converted into album-equivalent units for chart purposes. The number of copies that A Boogie Wit Da Hoodie actually sold, i.e. that people paid money for: 823. That’s right, under 1,000. As a commodity, recorded music has lost almost all its worth. Going to concerts, however, is something that music-lovers still value. Why, at a time when people are accustomed to getting music for free? An article on the journal Frontiers in Psychology looked at this phenomenon. Author Jean-Philippe Charron observed that music has become de-materialized. Fans don’t want to own a song or album anymore; their playlists and ability to share them have become more valuable than the songs within them. Charron says streaming has also disrupted one of the traditional motives to see live shows – the discovery of newer artists, as main or support acts. Now, he notes, people can try out any act for free, and not incur the financial risk of attending a concert that may be disappointing. Other than the love of music, the article cites two powerful social motives to attend concerts: the desire for interpersonal relations and esteem from others. Concert-goers feel a sense of fan community. Just as important, Charron argues, is the need to achieve status and obtain respect and admiration. It’s why you see so many people in a crowd taking videos and photos during shows. It’s not for their own consumption; it’s for others. It sounds so cynical. Whatever happened to being in the moment? I don’t have one image from any show I’ve ever been into. Never take them, so there’s never anything to share. If there’s anything exchanged, can’t it just be between audience and artist? A study reported in PLOS One, a peer-reviewed open access scientific journal, examined audience members’ physiological reactions to live music. For the study, conducted at Hokkaido University in Japan, people were assigned to attend a live performance. Ten weeks later, they returned to the same spot to listen to recorded performances of the same music. You know the feeling. You feel it wherever music is played live, whether in a concert hall, arena, club or – and this would have been one helluva gig to attend – up on the roof. Stuart Foxman is a Toronto-based freelance writer, who helps clients’ products, services, ideas and organizations to come alive. Follow me on Twitter@StuartFoxman, connect with me here on LinkedIn, or check me out atfoxmancommunications.com. I would love to hear from you. More articles like this coming, with original posts every week about communications, writing, branding, creativity, media, marketing, persuasion, messages, etc., etc.